Nastritessuti is a family-run business in the true Italian tradition, founded in 1974 by Alfredo Turcato, the father of the current owner, Lorenzo. The Company started out as a craftsmen’s business producing technical woven ribbons for a major company located in the north of Vicenza, which at the time was a world leader in the camping equipment sector. Over the years, our experience and on-going research for quality have enabled us to develop new types of woven ribbons and build up a catalogue, which today comprises over 1,300 articles. Nastritessuti today supplies Italian and international clientele in the fashion, footwear and leathergoods industries, ranging from fast fashion to high-end quality clothing. 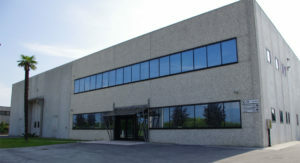 It is also one of the few companies to have maintained all its R&D, manufacturing and sales operations in Italy, in their historic headquarters in Marano Vicentino. Excellence as an objective: we are convinced that the secret of excellence lies precisely in the attention to every single detail and therefore we pay the utmost attention to detail when we design and manufacture our fabric bands for the clothing industry. Innovation and growth, day by after day: we believe in our personal and company growth experimenting continuously brand new yarns in order to create more and more new products and to meet the most exacting requirements of our customers. Respect for our local area, for the world in which we live: we have decided to keep our roots firmly in the local area and respect nature. Oeko-Tex certification of our products not only ensures quality, it also guarantees that our products do not contain any substances that are harmful or damaging to people or the environment. We develop and manufacture stiff and elastic ribbons, edgings, cords, belts, straps and pipings for the clothing, footwear and leathergoods industries in our historic headquarters located north of Vicenza. We will manufacture you any type of woven ribbon in any quantity, large or small, from standard models to the most highly detailed, custom-made jacquard patterns and special processes (printings, silicone nonslip coatings, etc.). Minimum order quantity is 350 metres, width from 5 to 100 mm. Most of our products are guaranteed, and not only by OEKO-TEX standard certification! We also believe our quality is the result of on-going research, that’ s why we consistently explore the fashion industry and bring out a new collection of trendy ribbons every six months.